The waiter here has just spilled red wine on a customer in a t-shirt and light dockers-type pants. I take it the guy will be getting his drink for free. 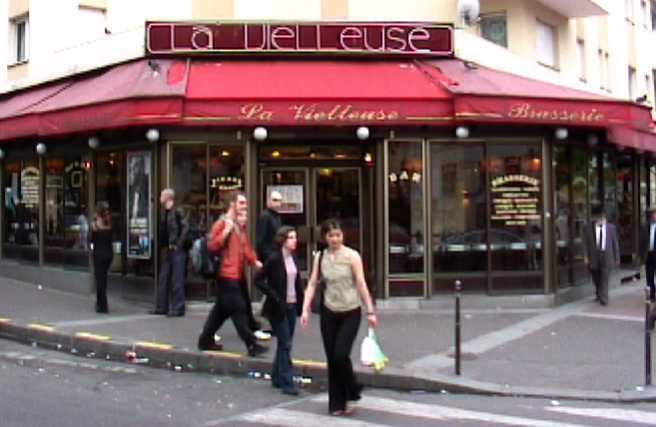 The waiter is older, slightly overweight, and has small glasses and a bushy mustache -- a sort of French Teddy Roosevelt. This place is huge, like a dance hall almost. The bar counter seems miles away from me, and in between there is more empty space than tables. Maybe they have bullfighting here or something on certain days of the week. There's plenty of room for it. 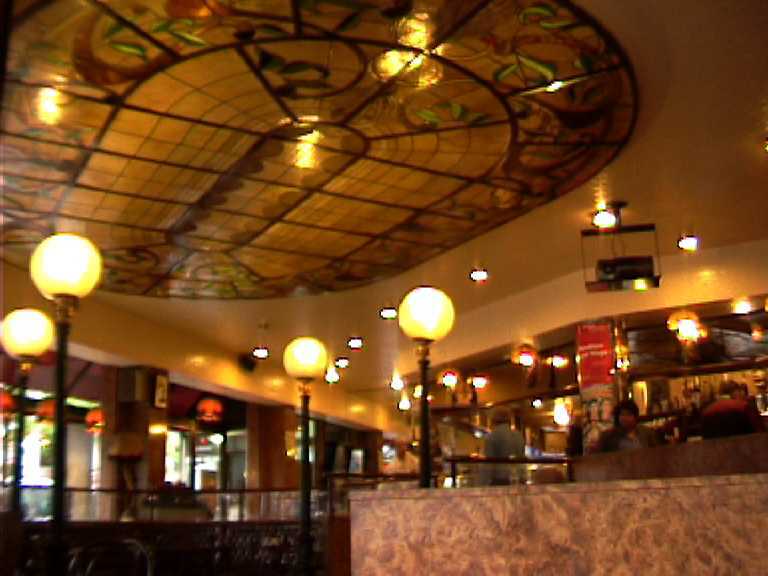 On the ceiling is a large oval-shaped stained glass design like a skylight, except that above the ceiling is not the sky, but rather at least six floors of apartments. My table is small, round, and has a see-through top with an advertising space within. No one's purchased any advertising for this table yet, though, so there is only a picture of a serene blue sky with sheepish clouds floating by. Nice. Much nicer than the actual sky outside that has no blue at all at the moment and seems to be varying shades of dismal white-gray. My espresso came with a packet of 2 sugar cubes. The chairs are brown metal with brown cushioned seats. There is almost no one else here and the waiter is using the opportunity to sweep the mostly vacant floor. It's about 20 minutes to 8:00 pm now, so maybe they close at 9:00, if not sooner. There are still a fair number of people sitting at the outside tables. 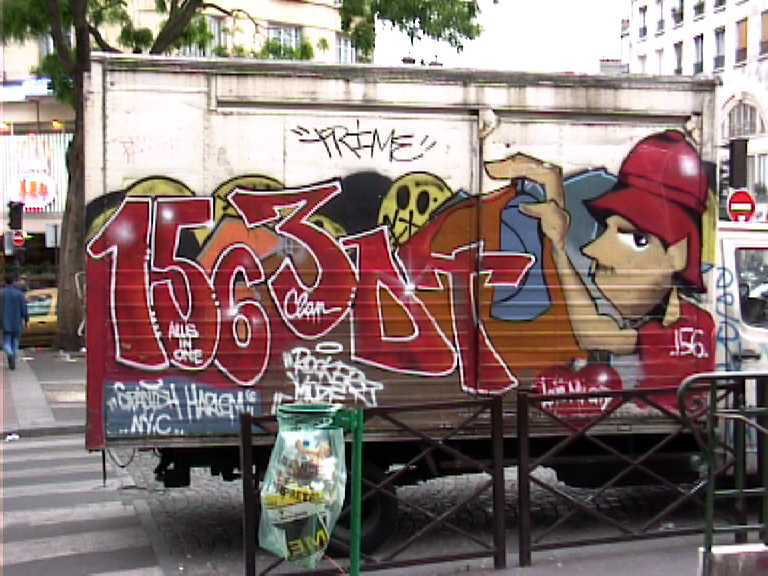 On the street is a truck that has been well decorated by one of the establishment graffiti artists in town; the tag is "1563DT" in red letters accompanied by a cartooney youth with no mouth holding a spray paint cannister. A dirty gray poodle is walking in and out of the place. NOTE: The place closed at 8:00 pm.